If you’re looking to experience everything that Canada has to offer and the amazing people that make up this country, head to the One of a Kind Show in Toronto. Its 11 days of non-stop creativity featuring over 800 Canadian makers. No two items are repeated because everyone puts their own creative spin on it, whether it’s concrete planters or greeting cards. Best of all there’s something for everyone. Whether you’re looking for a gift or wanting some girl time or simply staying warm – this is the place to be! There are a number of skincare vendors selling unique soaps. 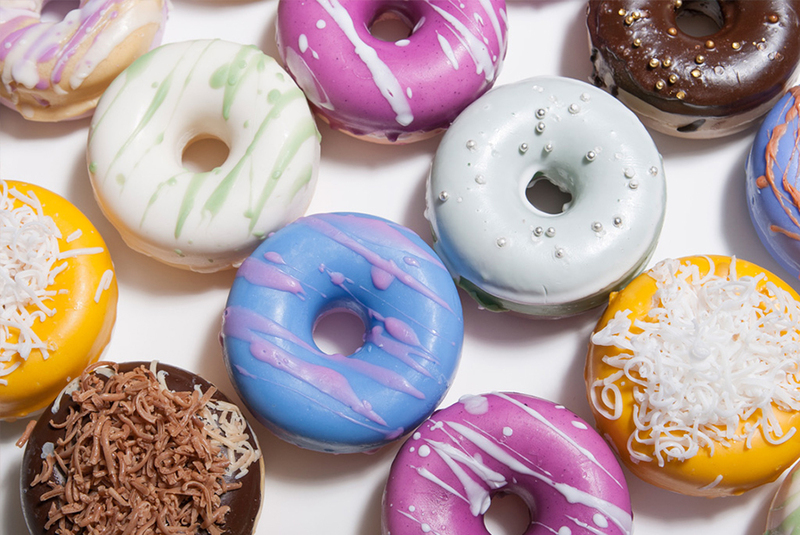 Demo Soap offers bath soaps in the shape of cupcakes and donuts. They look so real that you might mistake them for desserts. Sea Luxe offers more natural ingredient infused soaps for different purposes; like seaweed for its calming properties. They also have jars of what I thought was sea glass. 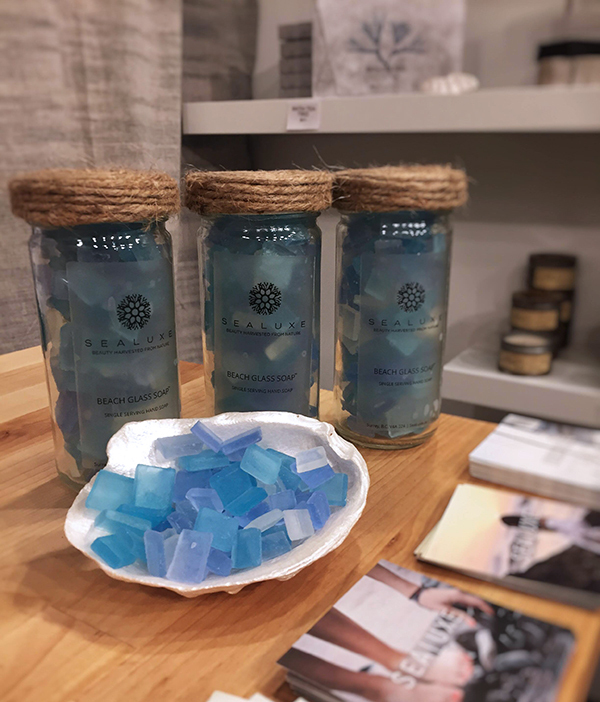 In fact, it was little chips of soap made translucent to replicate sea glass. The concept was to keep the jar in guest bathrooms so, everyone would take a piece for their own to use. How thoughtful! If you’re on the hunt for something unique and truly elegant – smell the perfumes by Monsillage. Isabelle has created a line of luxurious scents each with a unique story about her life. The One of a Kind Show is mostly a place for makers to showcase their talents and make there display inviting. Her booth was dark and unoccupied but the way she had displayed the fragrances caught my eye. Each bottle was identical with the fragrance sprayed on feathers. I reached for the one labeled Dupont Circle. It was the most enlightening and exhilarating scent. A concoction of sweet, floral and woody notes make up this perfume. I also got a free luxury soap on purchase. Yay! I still think giving greeting cards, especially ones with sarcastic wording, are always cherished and complete a gift. If you think so too, Everyday People Cartoons has some great ones. Cathy Thorne, the writer and designer, has a witty tone which I love. 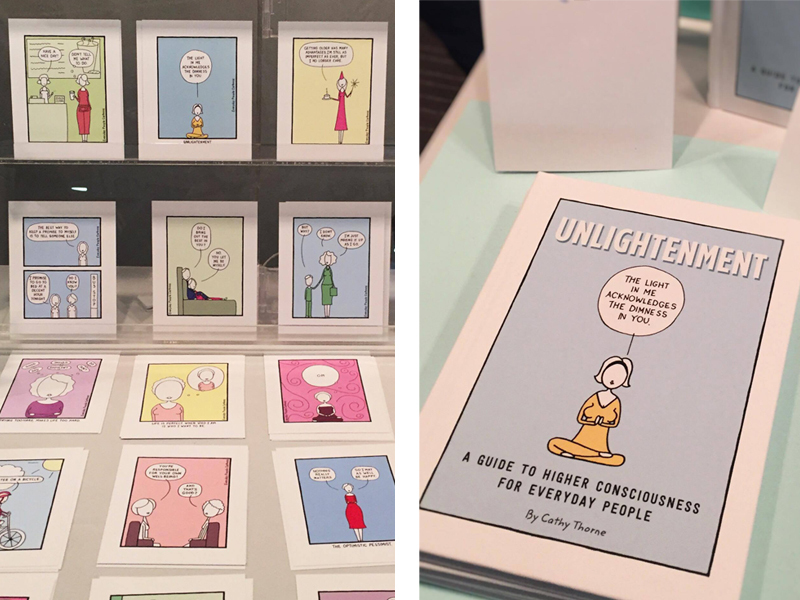 She just released her first book with Simon & Schuster called Unlightenment containing humorous comics about yoga, meditation, and mindfulness. Go, Cathy! I have 2 signed books by her about women and they’re hilariously on point. 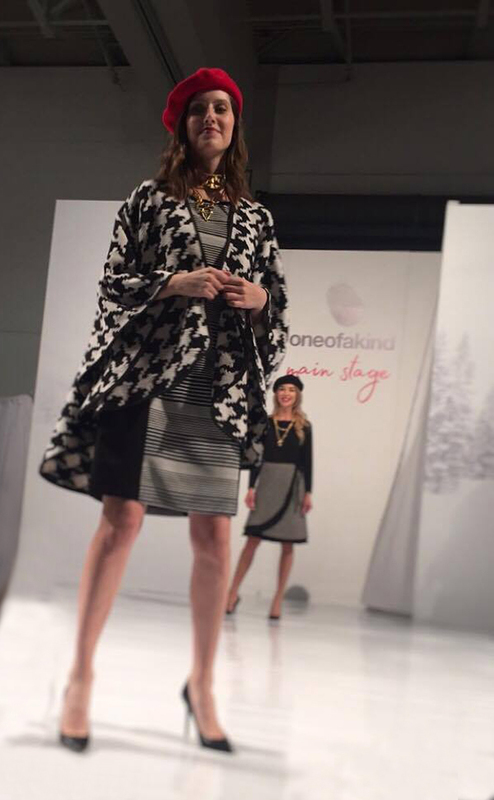 Ever wanted to be in the front row at a fashion show? Now is your chance. Every couple of hours there are fashion shows highlighting different designer’s pieces from clothing, jewellery to accessories. They show you how to pair the pieces to create looks you would never have imagined. 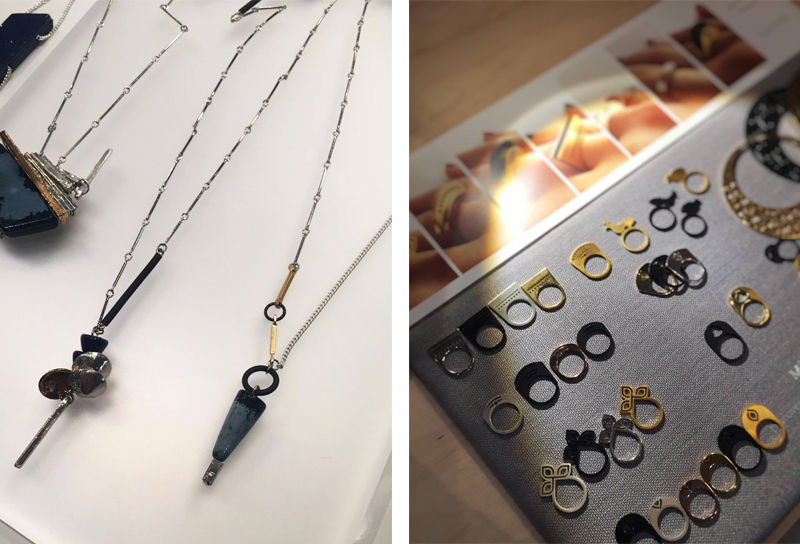 The jewellery from Anne-Marie Chagnon, Montreal based designer, was very unique. 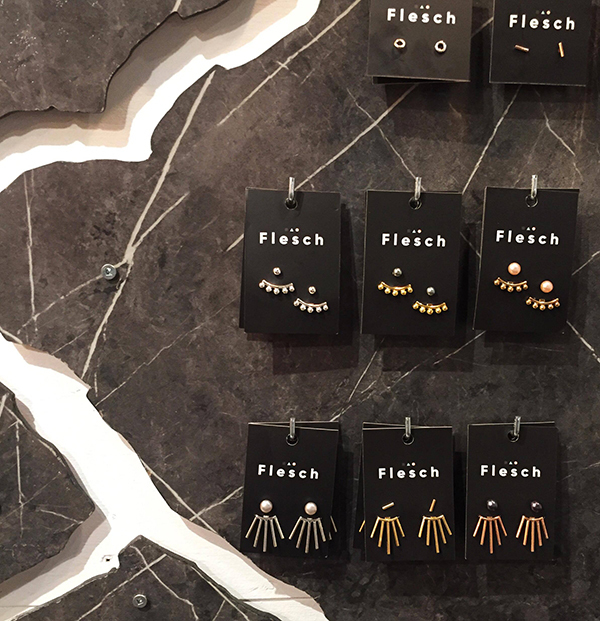 She utilizes different materials to create delicate bracelets, earrings and necklaces. Everything is truly one of a kind. Narinee uses laser cutting to create intricately complex earrings and necklaces. The rings are a hit because of the ability to stack and mix metals. Both things are very much on trend. I was looking for an everyday ring which I found at Flesch. Her Build Collection is made from repurposed tools such as screws and bolts. The slash ring I choose is from The Symbols Series. It is a combination of sterling silver and 14k gold plating. There are also a number of fine jewellery brands at the show, which makes for lasting gifts for loved ones. 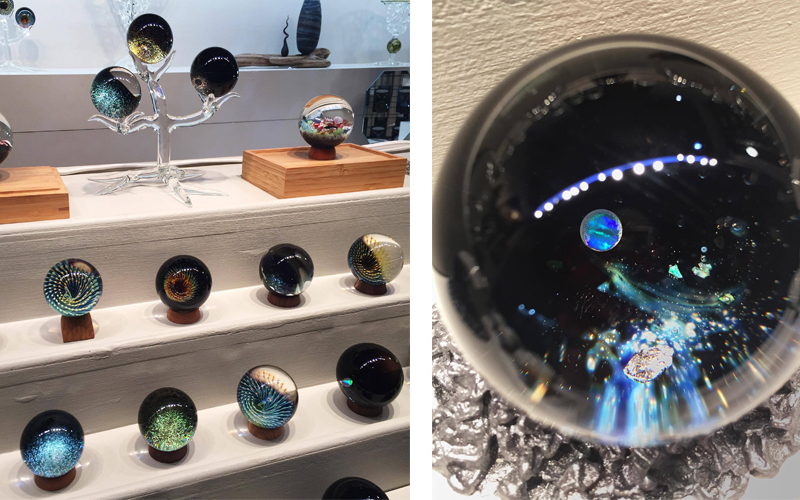 Some equally different gifts which are appropriate for everyone includes glass art by Brad Jesson. Creating just one of these decoration balls can take up to 4 hours. The detailing is incredibly defined. 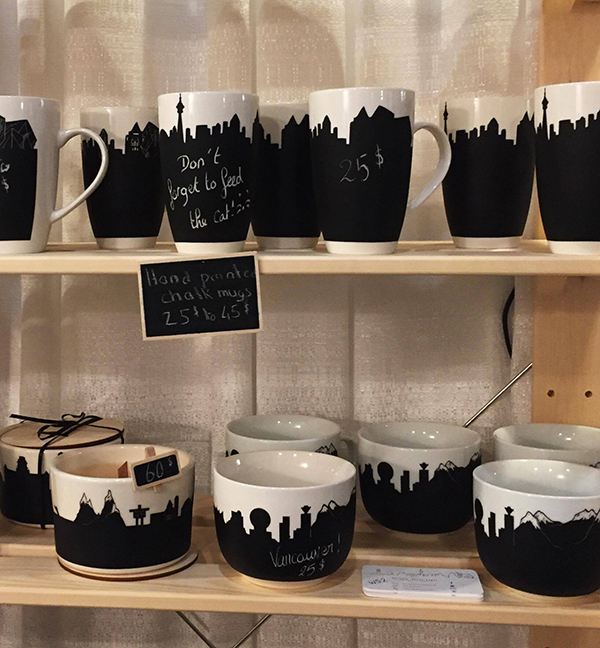 Alice in Montreal creates works of art on mugs in black paint. This allows buyers to write their own messages in chalk on the mug! I’ve saved the best for last. The snacks and spreads section is always the busiest and most culturally diverse in terms of vendors. For delicious homemade jams give Penny Candy a try. They incorporate herbs in the jams to create a nice fruity and spicy blend. Do make a pit stop at The Greek Chef. They offer 12 different hummus from herby to spicy. Best of all you can sample every one of them. My favourites are Jalapeno Cilantro, Slow Roasted Red Pepper and Lemon Garlic. 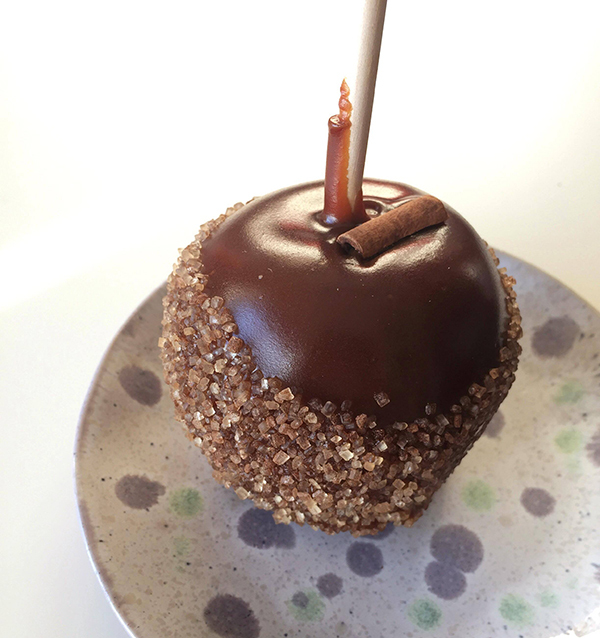 There’s plenty of sweet options too, like this different take on candy apples by Nut and Fudge. You can easily spend a full day here so make sure you refresh and recharge at the Soda Stream Hydration Lounge. 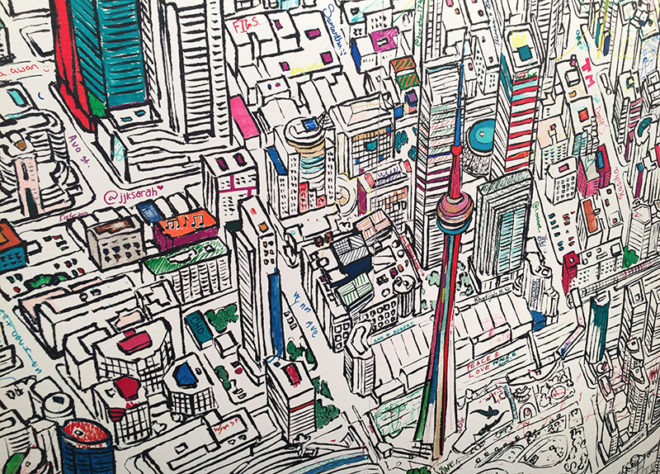 The One of a Kind show runs until December 3, so make sure you take some time to attend. For kids and adults, there are also workshops presented by DeSerres and Pebeo. I also made a video of the goodies I picked up at the Spring Show if you’d like to know what else you can buy. If this list doesn’t satisfy you, I’ve got tons of other gift ideas.